Hope for Tomorrow is a dedicated charity, bringing cancer care closer to patients’ homes via their Mobile Cancer Care Units (MCCUs). 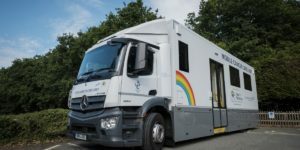 As a cancer charity, Hope for Tomorrow understands that time is a crucial factor for patients, and in 2007 launched the world’s first ever Mobile Cancer Care Unit to bring vital cancer care closer to patients, enabling them to spend more time with family, friends and loved ones. Hope for Tomorrow develop, build, provide and maintain MCCUs to support patients who are going through chemotherapy by alleviating the stresses and strains of travelling for appointments, along with reducing hospital waiting times. The Charity relies on their volunteers to help keep the wheels turning on their Mobile Chemotherapy Unit Project. There are a number of ways you can volunteer with the charity.